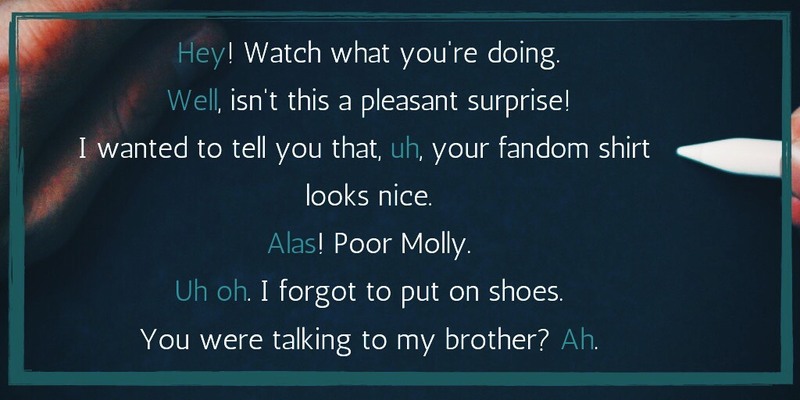 Sometimes, people don’t live up to our expectations. I feel like I’m in that camp right now. NaNo was incredible—I didn’t win, but I wrote more than 30,000 words, wrote 6 days a week for a month, and almost completely edited a short story. I learned I can do much more than I think, but I also learned how important it is for me to work at a slower pace. Juggling writing with teaching full time can be exhausting, though I absolutely love both of my jobs. This month, I’ve fallen behind on several writing things, AND I got sick for a bit, AND so I’m having to come to grips with my limits (and with conjunctions, which will make more sense in a couple hundred words). That’s okay, though. I don’t have to live up to anyone else’s expectations, or even my own expectations. God’s will is ultimately what matters, and if trying to meet my deadlines is making me more anxious and less loving of others—in other words, less like Him—then I need to be okay with changing my deadlines. Definition: Conjunctions link words, phrases, clauses or words together. For example, I went to the green and tan bookstore that is next to the coffee shop but across from the fire house where my friend works. 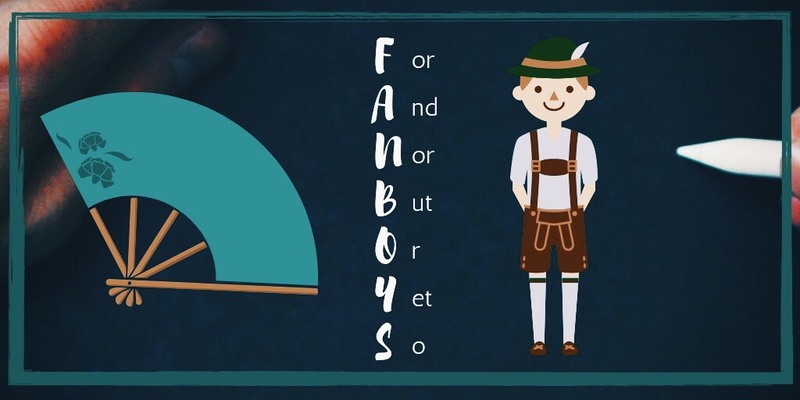 There are three broad categories of conjunctions: coordinate conjunctions, subordinate conjunctions, and correlative conjunctions. COORDINATE CONJUNCTIONS link ideas of equal importance to the structure of the sentence. For example, a coordinate conjunction might link two independent clauses (if that sounds confusing, wait a couple weeks! ), or it might link two words, but it wouldn’t link an independent clause and a dependent clause. SUBORDINATE CONJUNCTIONS link ideas of inequal structural importance. For example, it might link an independent clause with a dependent clause. Usually, subordinate conjunctions show a transition in time, place, or cause-and-effect relationship, or they make one clause less important. 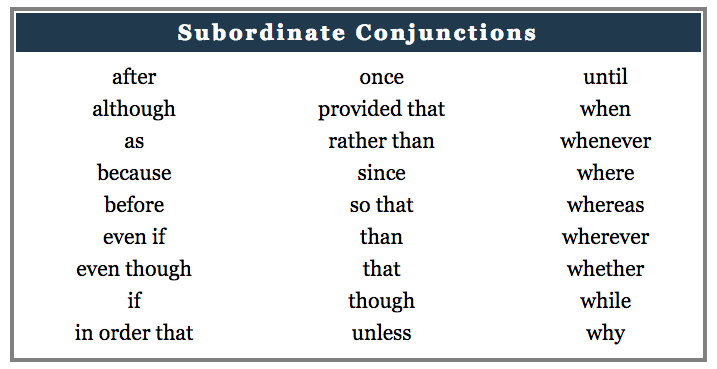 Here are some subordinating conjunctions: Here is a video on subordinating conjunctions from Khan Academy, which is an excellent resource if you have further grammatical questions that we haven’t addressed yet. We will either watch the newest superhero movie or go to the bookstore. Whether it rains or shines, we will have a fantastic day tomorrow. How can I pick when I love both crocheting and watercoloring? If the rookie makes the goal, then the game will go into overtime. So there you have it: Conjunctions. The last elementary part of speech is one I saved till the end because it doesn’t fit well anywhere else—and, well, that’s kind of the point of interjections. Definition: An interjection is a word (or sometimes group of words) that shows an emotion or feeling. Interjections either go at the beginning or end of a sentence or get inserted in the middle, interrupting the flow of thought (did you catch that correlative conjunction?). If they’re at the beginning, they’re usually followed by a comma or other punctuation mark. If they’re in the middle, they’re always surrounded by punctuation marks. Interjections can be super fun, but they can also be as overused as adverbs. It’s best to use discretion when interjecting. Okay, next month we’ll start talking about parts of sentences! Thanks for your patience! Update: I noticed a typo on the spine for Child of the Kaites, so there is officially a second edition of the paperback. I tweaked a few other things and am really happy with it, but there isn’t a huge difference between this and the first edition. You can find it here on Amazon. 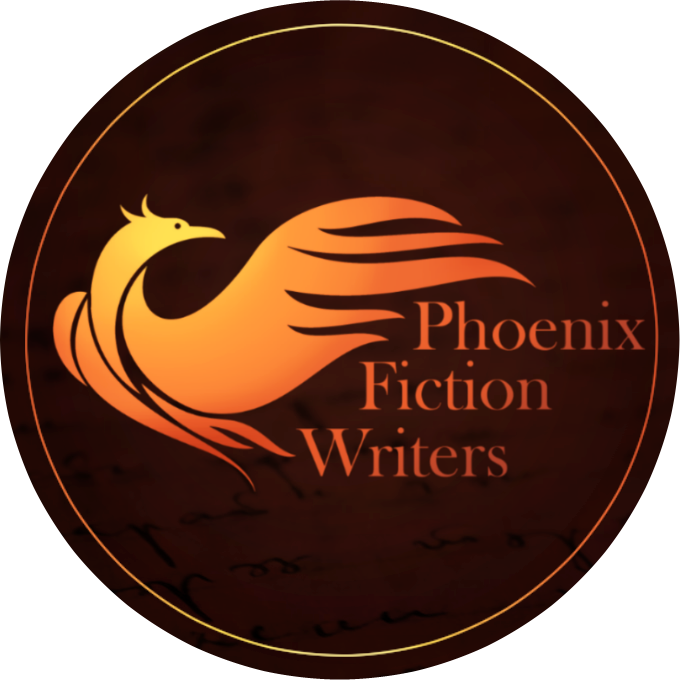 Second Update: Phoenix Fiction is having a sale! Child of the Kaites and The Weavers’ Blessing will be on sale, both ebooks and paperbacks.